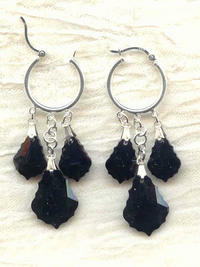 Three handsome baroque cut jet black Swarovski crystal pendants grace each of these handmade sterling silver earrings. The centre pendant measures 22 x 16mm, while the outer pendants are 16 x 12mm. They dangle from sturdy, high-quality sterling silver 20mm-diameter hinged earring hoops. The longest drop ends about 2-1/2 inches from the top of the finding. More fabulous drama from SPARKLE PLENTY. The small tanzanite oval glass drops I've used to make the pendant are vintage Swarovski, made specifically for the House of Dior.